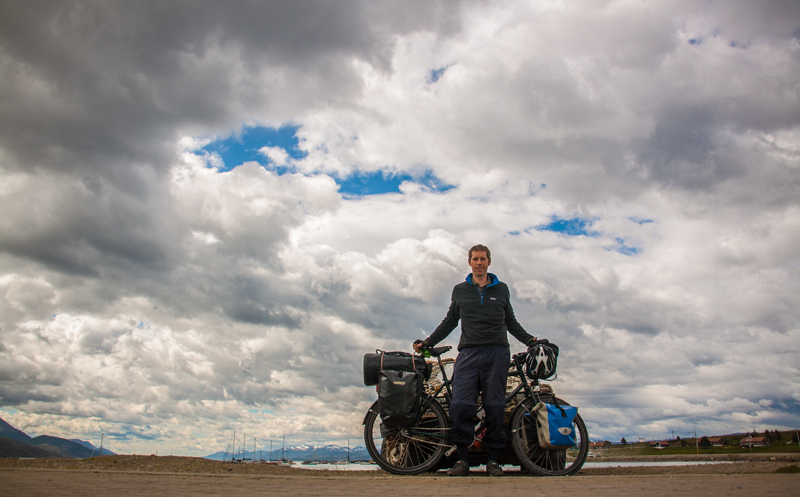 Today, Wednesday 3rd December 2014, I get on to my bicycle and I cycle out of Ushuaia. The same bicycle that I rode away from my front door and cycled to Spain on. Way back in July when I posted Time to Roll the Furry Dice, I dreamt of this day. I honestly gave myself less than a 50% chance of getting to Spain, I thought my knees would give in, let alone that I would get to cycle out of Ushuaia with the whole of the Americas stretching ahead of me. That sentence sends a shiver down my spine. I am an ordinary person, trying to make sense of life and play the cards I am dealt. This trip was an impossible dream I once had, something other people, who know more, who are more experienced, who are more confident individuals, did. I’m attempting to do something that makes me want to run home, eat a pizza, drink wine and watch TV. Yes I’m scared. Yes I don’t know what I am doing or quite what I am getting into. You never really do with anything in life until you begin. If I can have one wish from my words on this website. It is that someone reading it goes out and does that scary thing they don’t really believe they are capable of. The thing other people do but they can’t. Today I start painting my rainbow. I truly wonder how far it will go. To be able to begin is something I will treasure forever, as is all the support, love and encouragement from friends, family and strangers. Thank you one and all, however this is merely the End of the Beginning! Please share this post by talking, via email, or on social media with someone that you know who needs convincing they are capable of doing what they dream of. Trevelin (Welsh: Trefelin) is a town in the Patagonian Argentine province of Chubut. It is located in the department of Futaleufú, south of Esquel, and had about 6,400 inhabitants at the time of the 2001 census [INDEC]. The town was important in the Welsh settlement of Chubut. It was named Trevelin (from Trefelin, the Welsh for “mill town”) after the first mill, known as “Los Andes”, was established there by John Daniel Evans (es) in 1889. One of the tourist attractions of Trevelín is the grave of Malacara, Evans’ horse, who a few years earlier in 1884 had saved his master’s life by a prodigious leap. In 1902, following a territorial dispute between Argentina and Chile, the inhabitants of the area voted to remain in Argentina. The town, in the Valley of the 16th of October (es) (Welsh: Cwm Hyfryd/Bro Hydref), is near the Percy River (es), which flows south into the Río Grande, crosses the frontier with Chile, and thereafter is known as the Río Futaleufú. It’s not the distance, it’s the bits in between! There is a lot of Welsh remnants in this part of the world! thanks John and good luck to you too! That photo sends shivers down my spine (I’m talking about the background by the way, sorry Iain) I miss Ushuaia!!!! You won’t be the only one out there Iain. Just keep remembering that. We used to see motorbikes mainly in Tierra del Fuego, but sometimes hardier souls cycling (we’ve even sheltered a few crossing bridges with the truck to keep them safe from the wind). There’s some great little Estancias, and cafes along the route – watch out for them. They’ll be one or two motorbikes outside with place name stickers on, and a lot of helpful knowledge, the bikers will be tourists too so they’ll speak English. Thanks for the advice Jules, I’ll be sure to google Pichi! Have a great journey, which, come to think of it , is what life is all about. Never a truer word spoken Roger!